This industrial computer powers cutting-edge applications in the artificial intelligence, virtual reality, and autonomous driving markets. Optional NVIDIA® GPU with up to 250W TDP enables CUDA computing. The computer has an advanced design that handles the heavy power consumption and power transients associated with a 250W GPU. The patented design with tuned cold-air intake guarantees operation at 60°C with 100% GPU loading. With a GPU installed, there are still two spare x8 Gen3 PCIe slots. 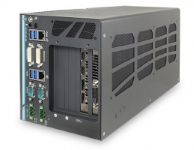 They can be used to add PoE ports, independent USB ports, and industrial I/O. This computer is available built to order with a NVIDIA GPU, processor, memory, and storage of your choice. Please contact us for a quote. * The CPU and GPU loading are applied using Passmark® BurnInTest 8.0 with 35 TDP CPU. Operating Temperature degrades with higher TDP CPU. Contact us for detail testing criteria. ** For sub-zero operating temperature, a wide temperature HDD drive or Solid State Disk is required.